Posted on April 1, 2014 by Adam M. Gee, Esq. Spring has arrived and it looks like we are finally SOON going to enjoy some warmer weather, so it’s time to get your bike ready for the new season. 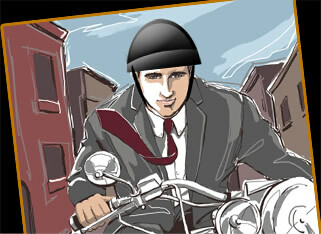 But before you go to the garage, take a few minutes to watch the video above about protective clothing. Will the clothing make you safer? 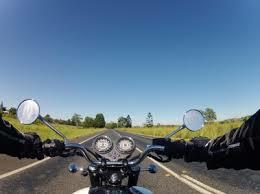 This is always my favorite time of the year, as I look forward to that first ride of the season. I recently wrote about road hazards awaiting us – potholes, potholes everywhere! – and if you have not read it yet, check it out after you finish reading this blog post. Finally, before you head outside, pull out your insurance policy and be sure you have enough coverage. 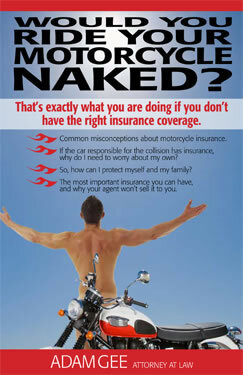 Read my free book, “Would You Ride Your Motorcycle Naked?” If you have questions about your insurance policy after reading the book, send me an email at [email protected] and I will try to answer it! OK, so it’s time to uncover your bike! Your fuel system: Gasoline is a mixture of volatile chemicals, and when it sits untreated for several months, parts of the mixture can evaporate, leaving behind a brown gunk called varnish. Varnish can clog the small jets inside a carburetor, leading to sluggish performance, hard starting or even no starting. You’ll at least want to drop the float bowls on the carbs, dump out the gas that remains, and clean out any residue with carb cleaner. In addition, you may need to unscrew the jets and clean them, too. Preventing this next year is as easy as squirting a bit of fuel stabilizer into your last tankful before winter. Then run the engine for a few minutes to get treated fuel into the carbs. If your gas tank was low when you parked the bike last year, it’s possible that condensation has formed in it. Draining all the remaining fuel and replacing it with fresh gas is your best bet. Your battery: It may well be dead or nearly so. Pull it, add distilled water to any cells that need it, and put it on a trickle charger. You can use a hydrometer to tell when it’s ready to use. Your tires: Be sure they contain the recommended air pressure, your brakes work smoothly and have adequate fluid, your chain is oiled and your air filter is clean. Bikebandit.com has more tips to help you get back on the road, and allaboutbikes.com has a handy set of tips and explains what a T-CLOCK checklist is! If you don’t know, it’s a must-read! Remember, motorists from Elmira and Corning to Hornell in the western Twin Tiers, and Sayre, Athens and Waverly in the east, have gone months without seeing many motorcyclists, so be very cautious and take it slowly this spring until our friendly cagers are more vigilant again! This entry was posted in Motorcycle Accidents, Motorcycle crashes, Motorcycle Insurance, Motorcycle Safety, Uncategorized and tagged accident attorney, accident lawyer, Adam Gee, Adam M. Gee, American Motorcyclist Association, Athens, attorney, Elmira New York, Harley-Davidson, Helmet, Motorcycle, motorcycle accident, motorcycle safety, Motorcycle Safety Foundation, Motorcycling, New York, new york motorcycle, New York motorcycle attorney, new york motorcycle attorney adam gee, new york state motorcycle laws, NY accident attorney, NY and PA motorcycle lawyer, NY biker lawyer, NY motorcycle accident attorney, NY motorcycle attorney, NY Motorcycle Lawyer, PA motorcycle lawyer, Pennsylvania, Pennsylvania motorcycle accident attorney, Road debris, Shopping, Twin Tiers. Bookmark the permalink.